» Are these dirt barriers necessary? Are these dirt barriers necessary? An apparent sediment fence where a path under Albany’s Pacific viaduct is being built. For some years now, you and I have seen long ribbons of black or orange sheeting surrounding construction sites in the mid-valley. I guessed these low fences were intended to prevent dirt and water from escaping, and wondered if they did any good. Now that I’ve finally looked them up, it’s apparent to me that in many cases stringing all that “geotextile fabric” is a waste of money and time. 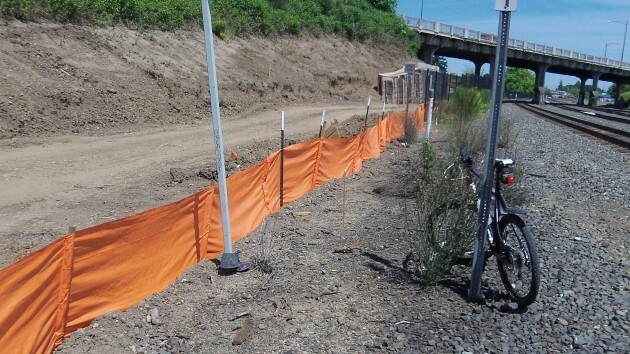 What we are looking on construction sites are “sediment fences,” recommended as a best management practice by the Oregon Department of Environmental Quality and evidently — from their ubiquity — required by some code. As the term implies, the sheeting is supposed to control sediment from construction sites lest it escape and dirty the waters of the state. Sounds reasonable — except in places where as a result of the flat topography there is likely to be no runoff even if it rains a lot. A year or two ago, the gas company built many miles of pipeline through the valley, and sediment fencing lined both sides of the construction corridor the entire way, which looked especially pointless where the work was done in perfectly level grass-seed fields. The fences are supposed to be set in trenches 6 inches deeep, but I’m not sure that is always done. Many of these barriers don’t look to me as though they could slow any flowing water. Though they may be unnecessary, they still cost money. In a comparison of erosion control measures, the Environmental Protection Agency says 400 feet of 3-foot fencing of this type on a 6-month construction project would average $3,200-$3,800 for materials, installation, repairs, removal and disposal. Lowe’s sells a 100-foot roll of 2-foot sediment fencing for $22.47, according to its website. This is what I call “feel good regulation.” As a former construction worker, I can tell you that in the majority of cases they are a COMPLETE WASTE of time (money). Just another regulation that drives up the cost of construction. Just another regulation that was put in place with no thought. Ever drive in the countryside around Albany? In the spring/summer you can often run into county road crews digging out the drainage ditches next to the road. Out comes vegetation that has grown there and they deepen the channel… because of sedimentation. You pay for that with your taxes. Ever see the Calapooia or Willamette or your local creek running muddy during/after a rain storm? Sedimentation. Ground covered in plants reduces the amount of sedimentation. Farmers routinely plant cover crops for the rainy season to preserve their soil by reducing the amount of sedimentation that occurs. Farmers know that ALL their fields (even ones that look flat) have to drain somewhere, and they want to save their soils so they pay the costs involved to try and save it. It’s a cost of doing business. Construction sites are particularly prone to sedimentation because they almost always involve removing vegetation, digging up the soils or bringing in more soils, to change contours. These loose soils are highly prone to causing sedimentation and easily wash into ditches, streams, storm drains or onto other peoples property. That means it costs the taxpayers and affected property owners real money to deal with the after effects. Ditches have to be dredged, big sewer pump/vacuum trucks need to clean the pipes more often, and maybe a homeowner has to have his carpet replaced because a silted up creek overflowed into their home. So, should we all pay the costs involved because the property developer wants to save $22.47 per 100 feet of silt fencing and installation costs? Or should trying to stop the problem before it starts, and keep that soil on their own property, be considered a cost of doing business? These regulations exist because real problems have been created by increased sedimentation and by the vastly increased amount of construction that occurs with our expanding population. Systems designed to help control the effects came because geo-engineers and scientists worked long and hard to try an develop cost effective methods to stop the silt run-off. Those methods did not just “appear”. They went through public review over the course of years. They were publicly debated and publicly amended before they were put into effect through the laws your elected officials approved. It is entirely true that in many situations the silt fences won’t work because they are not installed correctly Bad installation by the building contractors not following requirements is the politicians fault? That’s like hitting your finger driving a nail, and loudly blaming the hammer. “It’s a cost of doing business.” Yep, it sure is and that cost, and more, is passed on to the project owner or taxpayer, as the case may be. I’m not saying there aren’t situations where these fences help, but the regulation is a blanket requirement that does absolutely no good in MANY instances. Many times they don’t work because the situation gives them “nothing” to do. Level ground does not produce run off like sloped ground. Water on level soil percolates into the ground up to the saturation point. Then it will pond at the low point in the absence of slope. At the Lowe’s site, for instance, there is fencing ABOVE the construction area. Tell us all how that works? Remember, water runs downhill. Farmers have used several techniques for decades, like contour plowing, leveling, control ditches, etc. to conserve topsoil but I’ve yet to see fencing of this type on a farm. Again, there are situations where it’s very helpful but I see it in MANY places it does no good whatsoever. Sedimentation occurs naturally, with or without construction activity, and vegetation CATCHES some of it, making the problem you cite about ditches even worse, again with or without these fences. Isn’t this how your vaunted bioswales are supposed to work? The problem is, your beloved politicians and regulatory agencies use the “shotgun” approach, rather than requiring these measure only in places where it will be of true benefit. I think we’re seeing quite enough of what our elected officials are up to most of the time…….wasting their time on useless legislation. I know you’re a big government guy but where does it all end? Most of us were too damn busy making a living to attend or testify at some obscure public hearing on proposed regulations for a relatively minor problem. And if we’re talking publicly funded work (Davis-Bacon), the labor to erect these fences costs the taxpayer about $60 an hour when its all said and done. The actual material (stakes and fencing) aren’t the big cost here…it’s the labor. Do don’t try to deceive us with the $22.47/100ft figure. It’s not hard to see you’ve never figured actual construction costs, with overhead and profit added. Don’t forget what the bill to the public is to dig the shallow trench either. The COST to install 100′ of that fencing is SEVERAL TIMES what your figure suggests. What gets BILLED is 15%-25% more than cost. Construction companies have to cover overhead and make a PROFIT or they won’t be in business long. What you want is a site-specific, case-by-case review. And you think that will be cheaper? Guess again. You just went from cheap fabric and near minimum wage laborer costs with possibly a little trencher to make it faster. Now you bring in professionals at professional labor rates. Bad Idea. Ask the Builders Association if they want to trade the existing regulation for site-specific case planning that they will have to pay for. BTW, you can get the probable costs by looking in R.S. Means Construction Cost Estimation Guide. I used to use that when I did estimates for the architects I used to work with. I’ve managed projects where it was specified exactly what would be required and where such measures would be required in the past. They were a part of the plans and specifications….the contract documents. Where it can do some good, fine. Where it’s a waste of time, no matter how much lipstick you put on this pig, it’s still a pig, and a waste of time. One size fits all, right Bob?